Long ago on planet Amazon, a world with conditions similar to our own, a great civil war broke out. This planet was populated by many powerful men-like animals who could walk and talk and think great thoughts. 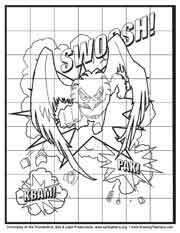 DrawingTeachers.com has prepared this Grid Drawing Worksheet frame to use with the Drawign Worsheets below. 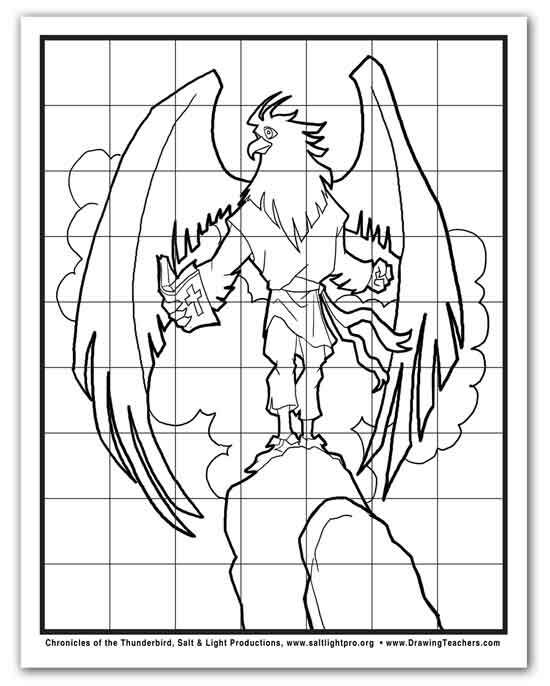 Simply print out the pdf file and use a ruler and pencil to connect the 1" Squares marked off in the frame borders. Check out for drawing supplies online. ...But there arose an eagle that was stronger, faster, and far more powerful than any other creature, the eagles wanted him to destroy their enemies and enslave the rest of the world to bring peace but he refused. He felt there was a better way. His name was Elijah and he was destined to become the world’s very first hero. You see Elijah had once been slothful and very laid back. One day as he decided to hide in the deepest forest in order to avoid a long days work but on that day something unusual happened and he stumbled upon a strange book. This book had a black leather case on it and on the cover were two words that stood out to the young eagle “Holy Bible”. Elijah read the book cover to cover, and he was intrigued by its stories and the Savior it spoke of. It was then he knew what he had to do. It was his destiny to share this book with the world; and so he did. Elijah created the Hero Forces an organization of powerful warriors who dedicated their lives not to war, but to protect those who were weaker than themselves and to teach everyone who was willing to learn about the love and blessings that God was willing to offer them. He believed the hero forces would be the answer to ending the war and it seemed that it was. The Hero Forces began to spread like wild fire and there were heroes all over the world teaching people the ways of God and one day it happened, the wars just stopped and all of the creatures made peace with one another. But there was one secret organization that did not like how the war had ended. The Shadow Kingdom still felt that they were superior to any type of Creature so this secret organization of many of the darkest selfish and destructive creatures banded together to take Elijah down once and for all. They created a powerful weapon and sent a powerful Serpent named Dreadful Scales to challenge him. He gave Elijah an ultimatum; if he did not fight him they would use the weapon to evaporate everything and everyone he cared about. So the Hero accepted the challenge and went out to fight him, but they ambushed him and he found himself alone battling not only the poisonous serpent, but also many other monstrous creatures. They thought they had him defeated, but that is when the unexpected happened Elijah began to transform and change into something different. He was more beautiful than ever. He was bigger and his feathers were all fiery red and he was far more powerful than you could even imagine. They called this transformation the Phoenix and it was the first and last time it was seen. The Dreadful knew that if the shadow kingdom was to survive they had to get rid of Elijah, so they tricked him and used the destructive weapon directly on him and he was never seen again. The shadow king was intrigued to hear about this transformation and to be sure this never happened again he had his men raid every eagles nest and village in the world and make sure that the entire eagle species was extinct. But his hunger for power got the best of him and he could not live without unlocking the mystery of the Phoenix so he secretly had his scientist keep one egg frozen in hopes that one day they would have a phoenix under the control of the Shadow Kingdom. "How to Draw a Cartoon Eagle - Elijah"